You should brush your teeth a minimum of 3 times per day. Once in the morning, once after lunch or as soon as you get home from school, and once before bed. At night, don’t forget to brush-on a small pea size amount of the fluoride gel right after you have brushed your teeth. 1. 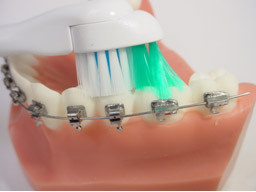 Brush all of the braces and also be sure to brush any appliances in your mouth. 2. Next, brush your teeth and gums along the gum line. This is an extremely important area that if neglected can easily show the first signs of decay (white spots) and gingivitis (inflamed and bleeding gums) NOTE: If your gums bleed when brushing this is a sign that you should brush more often. Neglecting the area will only result in more inflammation and bleeding. If the bleeding persists for more than a week call the office to have the area evaluated. 3. Then, brush the top (chewing) surfaces of all your teeth. 4. Proceed by brushing the inside surfaces of all of your teeth making sure to also brush the inside surfaces of your gums using a 45 degree brushing angle. 5. Finish by brushing the roof of your mouth and your tongue. These areas harbor a lot of bacteria that can quickly re-infect your mouth if they are not brushed away. 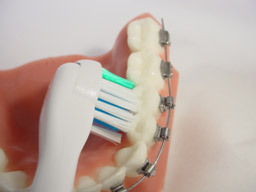 Flossing can be difficult with braces so we recommend using a proxy brush which can be easily manipulated between the braces and wire to scrub the teeth clean using an up and down motion. 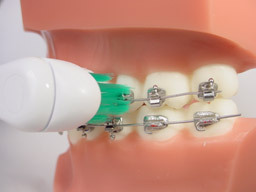 Should you wish to floss, use floss threaders to help get the floss under the wire between the teeth. Then carefully slide the floss between the teeth using an up and down motion in a C-shape against the sides of the teeth. Do not use a sawing motion because it can easily cut and damage your gums. 1. Brush your teeth at least three times a day using the electric toothbrush we provided. 2. 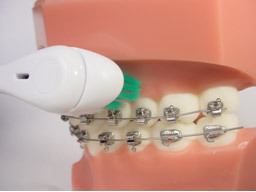 Use the proxy-brush or floss at least once a day. 3. Use the fluoride treatment at night before you go to bed. 5. Do not eat foods on the “NO” Food List. 6. If something breaks call the office so that we can quickly schedule an appointment to correct the problem. The tough CRUST of PIZZA is the best part, and the place where all of the bent wires start. A HARD ROLL or PRETZEL or BAGEL or BONE, will knock off the braces so leave them alone. DORITOS and TACOS with shells that are hard can be feed to the birdies in the back yard. POPCORN and movies are fun for all, but the pain POPCORN causes is no fun at all. BEEF JERKY and SLIM JIMS are fun to eat, but for wrecking your braces, they’re hard to beat. All RIBS and MEATS that are found on the BONE are the types of foods that should be left alone. CORN ON THE COB you should never eat, but removed from the cob, it can taste just as sweet. RAW CARROTS and HARD FRUITS are good for your body, but they damage your braces which is very naughty. HARD CANDY and LOLLIPOPS are a sweet delight, but will damage your braces if you ever bite. CARMEL and TAFFY and ALL TYPES OF GUM, stick to your braces which isn’t much fun. Biting ICE from a cool drink is refreshing I know, but it destroys your braces, so 1000 times NO. PENS and PENCILS aren’t food, but will ruin your braces; if you chew them they cause lots of unhappy faces. You’ve read the poem and now you’ve found out, all the foods on the “NO” list are the foods to leave out. If you want to eat foods you’re not sure are all right, give us a call before taking a bite. It’s tough to stop eating these foods for a while, but remember it’s all for a beautiful smile.